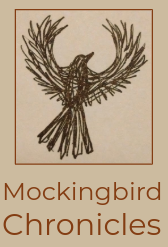 The Mockingbird Chronicles: poems, lists, musings on life in Skunk Hollow, a bit of a bowl near the Susquehanna River in York County, PA. I was harvesting in the cauliflower patch one October afternoon, talking to myself about starting a blog, and the mockingbird began to sing in the treeline. I have always had a pretty harsh internal editor, and it came to me as I stood there that I can fire my editor, and hire Mockingbird instead. “Use more words,” he says. “Repeat, repeat, repeat! If you don’t like the way it came out, repeat until you get it right. If you like what you said, say it again. Say it louder, say it in French, in Swahili, in Hindi, in Japanese!” No more excuses. No more abandoned journals. No more shame. Ah, yes, that internal editor. Glad you fired him and thanks to the Mockingbird. Now we get enjoy your beautiful writing. I appreciate the affirmation. Just this morning, I heard him back in the hollow with his irrepressible singing. Miss your readings Beth! But keeping my study of Tarot up, and finding wisdom in your blog. Oh, Thank you, Eliza! I miss our readings, too! I think I might have to pick up some reading days this summer again if Sarah will have me. Bright blessings! Beth, your blog is beautiful. It is beauty and so are you. Thank you for sharing your world with me, for sharing your heart. Thank you, Christine! I am so glad to be getting to know you online. I hope I will get a chance to meet you in person someday. We get so busy with the farm and the kids that I don’t often get into town, but I want to come to more readings and events this winter. Much love. Please keep writing. I love both of your books. You will make a fabulous teacher. I wish I could occupy a seat in your class, but I think LMH might frown on that! best reason I’ve ever heard for starting a blog! Beth – My name is Sandra Howell-Zack. I am Jan’s daughter, Katie’s mom. My mom shared one of your posts with me today and I have to say this is just so inspirational!! Thank you for sharing these posts! Hi Sandra! I’m glad to meet you here. I love your mom. What an inspiring and gentle soul she is. I’m glad you like my posts.